How did you get your first job in lighting? Can you make more money as a designer or a technician? How do you stay busy in the touring world? How do you stay happy and sain on the road? How does cruise work compare to bus and truck touring? What are the basics I need to know to start working in lighting? 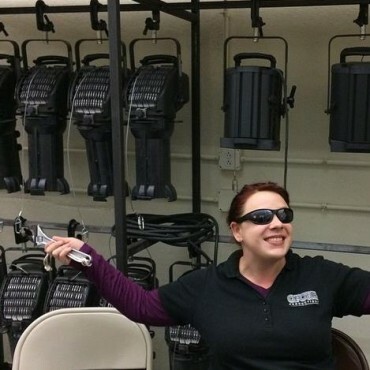 How do you feel being a woman in the lighting design industry? What are some lighting horror stories? All music in this episode by Stockholm Vodou Orchestra. I have more work more often [as a tech] than I would as a designer. I have my little niche in the touring world. I am a stage management lighting split. Which has, on the small and medium scale tours, become a necessity. Most of these tours go out with a 25′ box truck, which doesn’t require a CDL. I’m a stage management lighting split. The minute they would see that…Ok, come here. When it came down to it, I had my pick of what show I wanted to do. If you are touring with 10-15 people, it’s important to have some alone time because you are seeing the same people day in and day out. It’s very important to understand what you need out of the day and make sure you get it. Generally whoever is asking will tell you want they want. If they don’t, ask. Generally once I dock the truck in front of a bunch of stage hands my level of respect goes up. I have a very specific genre of books that I like to read. It is historical fiction that takes place in NYC 1880-1912.